American Phillip Imel spent a year working in Yekaterinburg and says he wants to return and live there after his retirement. 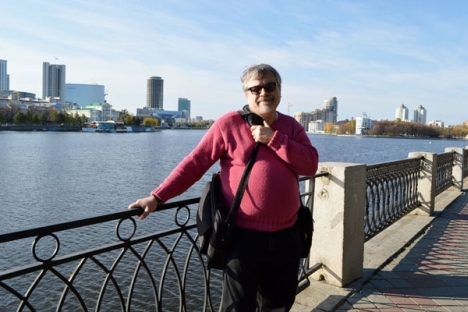 After falling in love with the city of Yekaterinburg, Phillip Imel, a 54-year-old college professor from the United States, talks about how the capital of the Western Urals won him over. Rossiyskaya Gazeta:Philip, can you please explain how you found yourself in Yekaterinburg? Of course, I haven’t travelled around the whole world, but I have never come across such attentive and considerate people in any of the places I have been to – Great Britain, France, Denmark, Tunisia, or Canada. I am being honest when I say I would like to go back. As a matter of fact, I am planning to travel there for a couple of weeks in May. After my retirement, my wife and I are planning to spend the summer in Yekaterinburg and maybe even part of the autumn. RG: People say that the ecology here is bad, Are you not concerned for your health? P.I. : I lived for some time in Lipetsk. I don’t know if you are aware of this or not, but the world’s largest steelwork plant is there. The environment is really polluted in Lipetsk, while Yekaterinburg remains quite clean. Although you can’t drink the water straight from the tap and you need to buy bottled water, but we have grown accustomed to that. On the other hand you can buy fresh fruit and vegetables on any street corner at any time. I really miss those kiosks now, and the small Russian shops. RG: Which other Russian cities have you visited? P.I. : This is my sixth visit to Russia. I have travelled quite extensively around the country: I have been to Ivanovo, Lipetsk, Moscow, St. Petersburg, Veliky Novogorod, and Kazan. I also worked as a lecturer in Ivanovo and Lipetsk, just like I did in Yekaterinburg. Interestingly, when you mention the word Russia abroad, people come up with just two associations – Moscow and St. Petersburg. I think, this is wrong. It was Yekaterinburg that became the most attractive Russian city for me. Can you imagine, this was where I watched a ballet for the first time in my life and I literally fell in love with it! The local Theatre of Opera and Ballet is really great. Not only do the artists there excel in dance technique, they really pour their soul into the scene itself. RG: Did you encounter any problems with the language? P.I. : I speak a little Russian. My knowledge of the language was enough for everyday life. Naturally in order to teach you need to command an entirely different vocabulary, so I would give lectures in English. I have several Russian friends who don’t speak much English but our knowledge was sufficient to understand each other. RG: Tell us about the people you met. What was it in their character or their behavior that surprised you? P.I. : That is a story in itself, and one that in my understanding could only happen in Russia and maybe only in Yekaterinburg. Somehow I became seriously ill, and by chance I met a young man I knew from some English lessons that my wife and I had been invited to. He said that his father was a doctor and that he could help me. He called his father and he came to my home and examined me right there and then. He refused to accept any money for this. I just could not believe that something like this could happen. I miss that fairly close-knit, almost communal way of life. My wife also felt comfortable in the city, we never encountered any serious problems while we were living there. Well, we once bumped into a drunk and that was quite unpleasant. This however is not just a Russian problem it can happen in any large city in any corner of the globe. RG: How did your relationship with the university staff develop? Was it easy to fall into step with them? P.I. : At the university I was treated as one of the team. When you come to Russia as a lecturer on a grant the university will naturally respect you, but they won’t allow you to play any kind of an important role in the day-to-day running of the institution. At the UrGEU (The Ural State University of Economics) it was different. The lecturers treated me as if I was part of the faculty. RG: I was in America this summer and I understood how immediate Americans can be in terms of friendships. They can treat anyone, even a stranger, like they were old friends. Did you notice anything similar among Russians? P.I. : It seems to me that Russians understand the meaning of the word friendship differently. In America we refer to acquaintances and friends in the same way – as a friend. However, to say in Russia that you have a friend is to mean someone that you can call at 3 in the morning and ask for help. All the rest are just acquaintances. It is as a result of this same selectivity that Americans often think that Russians are unfriendly. This is not the case. It is just that they need to get to know a person first. If after this they call you a friend, then this has a very deep meaning. RG: Recently it emerged that Yekaterinburg lost the race to host the EXPO-2020 exhibition. Many of the city’s residents are disappointed by this news. P.I. : It seems to me that this was a mistake. Dubai was probably chosen because it is warmer there. I would say this to the citizens of Yekaterinburg: Hold your head up high because you have so much to be proud of. I think that Yekaterinburg will grow and gain strength in the next 10 to 15 years. I hope that it doesn’t become like Moscow. Yekaterinburg is a huge city with a village feel. In a village everyone looks out for each other, and a village takes care of it’s own. In my imagination, Yekaterinburg is the same. It cares for its own and also of its foreigners. At present my wife and I are planning to give something in return. My colleagues from the UrGEU recently visited us in our home. I hope that both they and my students will visit us here again. We would be delighted to meet them.